Gulf Shores – Orange Beach is a well known resort area with many fine restaurants and accommodations as well as a variety of attractions and recreational opportunities. The Gulf Shores – Orange Beach Loop begins at the bridge over Perdido Pass, east of AL 59 on AL 182. Little Lagoon hosts a fair number of shorebirds, gulls, terns, Brown Pelican and, occasionally, American White Pelican. Chances to see rarities increase during migration. Reddish Egret occurs here regularly. Birding is usually best around low tide. At Perdido Pass / Alabama Point-West, rock jetties extend a considerable distance out into the Gulf on this side and can be accessed by walking west along the beach. 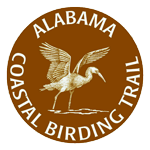 The birder then may observe the winter seabirds that may be in the area, such as scoters, loons and phalarope. Gray Kingbird is possible at the Shelby Lake Picnic Grounds during the summer months and large numbers of transient Black Terns are often observed flying along the Lake Shelby’s edge in late summer.